The LGBT Resource Center coordinates the ‘Safe Zone’ Program in which faculty and staff members are invited to attend an initial orientation session and monthly luncheon discussions. 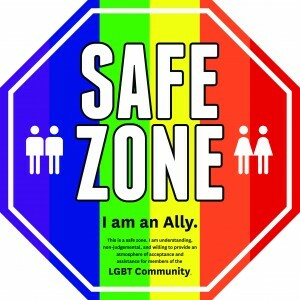 At the Ally Orientation and Introduction Session, participants learn about the LGBT campus resources, the LGBT student experience and receive a ‘safe zone’ sticker for their workplace. The monthly luncheon discussions address various matters affecting LGBT students at USC. Past discussions have addressed mental health, substance abuse, marriage equality, international student perspectives and many more. More information is available on our Safe Zone page. Faculty members are important Allies for the LGBT Community in large part because of the respect they receive from students, administrators and staff members on campus, and also because their opinions inside and outside the classroom can have a profound effect on one’s personal development. Below are some resources to make the classroom more inclusive. Staff members are crucial Allies for the LGBT Community because of their regular interactions with students outside of the classroom. Their opinions of support for the LGBT Community or willingness to learn more about the LGBT Community can make a difference in the campus culture. Below are some references for to enhance education for staff members.